I want to live my best life at any age. I’ve never understood our culture’s fear of getting older. Each year is a brand-new journey, from the time we are born, to when we blossom into adults at age 18, to our mid-life adventures, to the wise years in our 60’s and beyond. We should continue to experience our world with curiosity, energy, and hope during every life transition, at every step of the way. 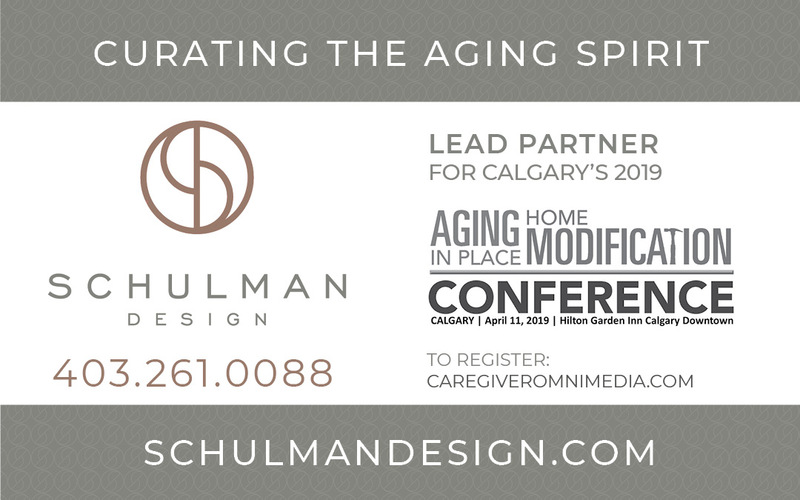 That’s why Schulman Design was so passionate about working with Caregiver Omnimedia to bring the Aging in Place Home Modification Conference to Calgary on April 11. Our homes are a sanctuary for physical and social well-being. We love our homes but it’s important that they love us back. Our goal is to raise awareness about the importance of accessible design for people of all ages. Remaining in our homes and communities is proven to lead to better health outcomes. Many families experience unexpected life events when a loved one is in an accident or develops a serious illness. Their only option is to react to the situation, which is never easy. We want people to be prepared. It costs about $1,000 a day to house a senior in a Calgary medical ward—we can no longer rely on this method of care. Aging affects all of us as care providers, community and family members, industry partners and taxpayers. My clients (and family members!) have significant mobility needs, resulting from health issues, surgeries and accidents. Even I have had mobility challenges at points in my life. Between the costs of institutional care, waiting lists and the desire to remain with our loved ones in our communities, we can no longer afford to neglect this issue. This is the human rights issue of our time. The Conference will address the critical issues of home modification funding, regulations and standards, and industry approaches with experts in the industry who are stepping up to tackle this important issue. Who should consider attending this conference? Anyone who is aging or knows someone who is. Let’s curate the human spirit together! Here’s a link to more information and online registration. Use the promo code: SDIRATE for a reduced rate! Curating the human spirit. We improve and enhance the lives of those with physical or cognitive challenges to live life to the fullest through seamless, functional interior design.